Print out templates or draw flowers yourself. Transfer the templates onto the wood. You can either place the flower onto a round piece of wood like a stem or you can saw out the entire flower including petals. The flowers with a stem can then be placed into a flower pot, or a ‘base plate’ is made onto which the flower can be attached. Nice bright colours give the flowers a springtime look. If the flowers are to be used as outdoor decoration, then oil paints and varnish should be used to make the wood reasonably water tight. For indoor use, wood approx. 4-8mm thick is suitable, for outdoors, the wood can be 1cm thick. It also depends on how big the flowers are to be. 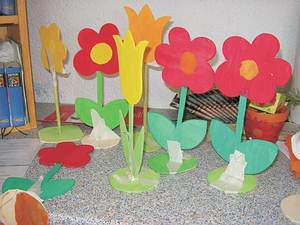 After sawing the flowers, smooth any edges with sandpaper.